Ellen DeGeneres is a powerhouse name these days, associated with a successful talk show, awards shows and talent competitions as well as a serious love for dancing -- something she's even shared with President Obama. But 15 years ago, on ABC's "20/20" in April 1997, days before the airing of the episode in which she announced that she was gay, the funny, kind, brave and huge star of her own show shared her fears of coming out. "If they found out I was gay, maybe they wouldn't applaud," she said. "Maybe they wouldn't laugh. Maybe they wouldn't like me if they knew that I was gay." During that April 30, 1997 episode of "The Ellen Show" -- called "The Puppy Episode" -- DeGeneres sat across from her psychiatrist, played by Oprah Winfrey. "It's not like I'm looking for perfection," DeGeneres' character said. "I just want to find somebody special, somebody that I click with." "Has there ever been anyone you felt you clicked with?" Winfrey's character asked. "What was his name?" "Susan," she replied. Laughter and applause followed. Advertisers such as JCPenney and Chrysler, though, decided not to buy airtime during the episode. Wendy's decided not to advertise on "The Ellen Show" at all. A lot has changed since the day that show first aired. JCPenney has tapped DeGeneres as its spokeswoman and supported its decision even when One Million Moms, a "pro-family advocacy" group, threatened to boycott the national retail chain for refusing to fire her. In 1996, a Gallup poll showed that the public approval rating for gay marriage was 27 percent. It is more than 50 percent today. And there are now 34 shows featuring gay characters in leading and supporting roles -- not including reality TV -- compared to only 11 shows in 1997. In the "20/20" interview, DeGeneres said she was willing to risk people knowing. "I decided this was not going to be something that I was going to live the rest of my life being ashamed of," she said. She said she came out on the show for the teenagers who contemplate suicide when they realize they're gay -- and for the young, confused girl she once was. "I do like men and I had, you know, a guy in high school that I wanted to marry desperately," she said. "He's the mayor of some small town in Texas. I could be the mayor's wife right now." 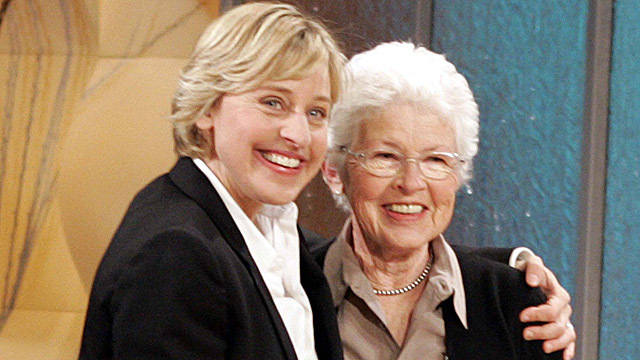 DeGeneres said she told her mother, Betty -- who appeared briefly in that April 1997 episode -- when she was 20. It was the summer of 1978 and they were in Pass Christian, Miss., visiting her aunt's house. "We were walking along the beach and -- with our pants rolled up and barefoot -- and the water was coming in," DeGeneres said. "I said: 'I'm in love.' And she says: 'That's great.' And I said: 'It's with a woman.'" "And she said: 'I'm gay' and started to cry," her mother recalled. "Maybe I cried with her." Betty DeGeneres said that though she asked her daughter questions, she wasn't horrified, just worried. "She never has understood it -- and I don't think she understands it now," DeGeneres said. "But she loves me and she sees how happy I am." DeGeneres, ever the jokester, was not immune to the pain and hurt inflicted even by some very close family members, though. "That was bad because they loved me and I loved them," she said. "And they didn't want me in the house." She said that wanting to be accepted for who she is drove her to come out on television that year despite Jerry Falwell, Pat Robertson and other members of the evangelical community who said they were disappointed. Some called her "Ellen Degenerate." "You know Ellen is such a good person," her mother said. "Now, I don't want to get weepy, I don't, but she's so good that she shouldn't have all this directed at her." Today Betty DeGeneres fights for gay rights. She is devoted and always tolerant. +Who Is Grammy Winner Esperanza Spalding?